SCHMALTZ (Yiddish): 1) melted chicken fat. 2) Excessive sentimentality; overly emotional behavior. 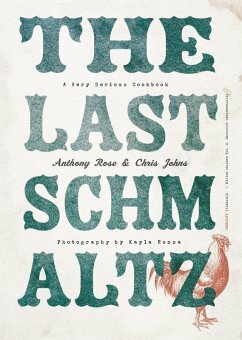 From one of Toronto's most magnetic chefs and restaurateurs comes a long-awaited cookbook that has just the right amount of schmaltz. Whether you know him as Toronto's King of Comfort Food, the Don of Dupont, or the Sultan of Smoked Meat, a conversation about the food and restaurant scene in Toronto isn't complete without mention of Anthony Rose. From his famous Fat Pasha Cauliflower (which may or may not have caused the Great Cauliflower Shortage of 2016) and Rose and Sons Patty Melt to his Pork Belly Fried Rice and Nutella Babka Bread Pudding, Anthony's dishes have consistently made waves in the culinary community. Now, in his first cookbook, Anthony has teamed up with internationally-renowned food and travel writer Chris Johns to share his most famous recipes and stories. Be amazed by the reactions Anthony received when he ingeniously invented a dish called the "All-Day Breakfast." Thrill at the wonder Anthony felt when, as a young Jewish kid, he tasted the illicit lusciousness of bacon for the first time. Or discover the secret ingredient to the perfect shore lunch on a camping trip (hint: it's foie gras). 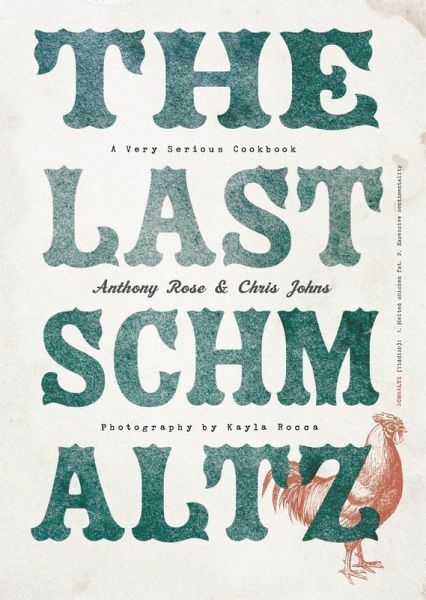 Often funny, sometimes ridiculous, but always delicious, The Last Schmaltz is a peek into the mind of a much-loved chef at the top of his culinary game. ANTHONY ROSE is the chef and co-owner of the Wilder and Rose group of restaurants in Toronto: Rose and Sons, Big Crow, Fat Pasha, Schmaltz Appetizing, Bar Begonia and Madame Boeuf. He has worked with Michelin-starred chefs in San Francisco and New York, led the kitchen at Toronto's The Drake Hotel and garnered rave reviews for his own restaurants. This is his first book. CHRIS JOHNS is one of Canada's most respected food critics and food writers. His writing has appeared in enRoute, The Globe and Mail, Wallpaper, Toronto Life and many international publications. He is the author of A Taste of Prince Edward County and the co-author, with Derek Dammann, of True North.